Denison Witmer quietly released his debut effort, Safe Away, in early 1998. The album, produced and recorded by The Innocence Mission’s Don Peris, slowly gathered fans to Witmer’s intimate acoustic based songs. The California independent label, Velvet Blue Music, enlisted Witmer to release two songs from Safe Away and three additional tracks as the cdep River Bends in late 1998. Two of the additional tracks were recorded with Peris, but produced by Witmer himself, and the track, “You Got Me Good”, was recorded to 4-track by Denison. 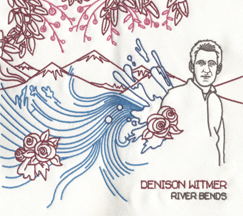 The five tracks on River Bends showcase Witmer’s songwriting talent, spinning lyrics of nostalgia, love, longing, and broken heartedness. Each of the songs on River Bends remain in the setlist of the many live shows and are continually requested by fans. “Healing Time,” “St. Jude,” and “You Got Me Good” are only available on River Bends and are now available on Burnt Toast Vinyl for the first time since the original issue went out of print. The original version is so often requested that a re-issue was necessary. The new version features a special digipak with embroidered artwork designed by artist Andy Bruntel who also did the artwork for Witmer’s Burnt Toast Vinyl edition of Safe Away.